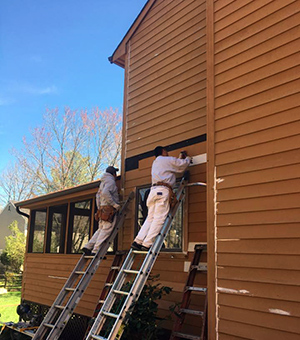 Wockenfuss Painting specializes in cedar siding home restoration, board replacement, staining and all other aspects of restoring or maintaining a home with cedar siding. 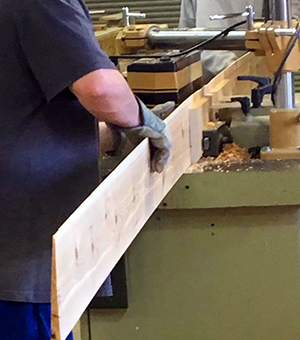 No need to hire a carpenter when Wockenfuss handles the project all carpentry work is done by our skilled professionals. Does your home have fiber cement board siding? 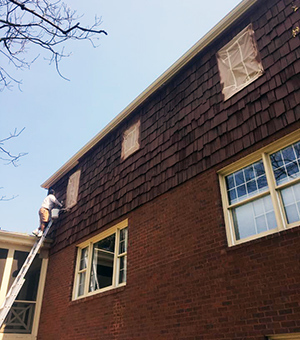 We are also experts at replacing those boards as well as any painting or staining work that needs to be done to siding, trimwork, sheathing and more. Reviews below are from satisfied clients. 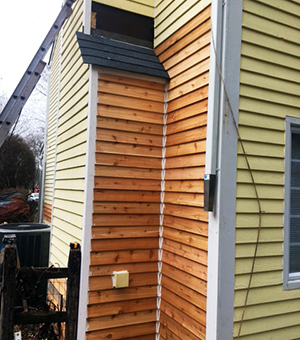 Be sure to call or email us today for a free estimate on your cedar siding home project. Replaced cedar shingle siding on two entire walls, replaced shingles elsewhere where needed, replaced rake boards and door trim. Stained house, garage, doors, and decks. Powerwashed decks. "From start to finish this was a professional job. The detail work required to hand shape almost every shingle was impressive. David Wockenfuss, Francisco, and the rest of the crew were pleasant to deal with, responsive to my requests, and interested in doing an excellent job. I recommend them highly!" Painted the entire exterior of a cedar shake house and re-glazed all windows. "We could not have had a better experience with Wockenfuss. Our house is 130 years old, and it now looks like new. They powerwashed, scraped and painted the entire house, and reglazed all of the windows. David Wockenfuss was fair and honest, which is something you don't always find. His crew was very professional and courteous. They made sure to pay attention to all of the details, for example they repainted our porch swing to match the house. They even stayed late to help me get all of the old windows open at the end of the job. Our house is covered in mostly cedar shake, so it was not an easy job. However, David and his crew made it look easy. I would highly recommend them to anyone who is looking for quality work at a good price." "If you have a cedar or wood sided house - Wockenfuss Painting is the group to use to have your house painted. I could not be happier with the end result and the work they did. They cleaned the house well, spent a full day plus caulking and repairing / replacing damaged siding and trim - and then stained the whole house and trim. The job was done neatly and on time - professional and courteous crew - great to work with. After a couple of bad experiences in the past with painters - I could not have been happier this time around and will definitely use them in the future. Thanks for a great job - I am still getting compliments on how great my house looks now." Wockenfuss repairs and staining of cedar siding and cedar shake on homes throughout Howard County MD including Columbia, Ellicott City, Clarksville, Laurel, Jessup, Glenelg, Dayton, West Friendship, Cooksville, Lisbon, Glenwood and Savage as well as Catonsville, Woodlawn, Pikesville & Randallstown in Baltimore County and Sykesville in Carroll County Maryland.